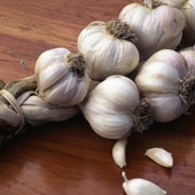 Garlic oil contains diallyl trisulfide, which releases hydrogen sulfide in the body. ORLANDO—A potent-smelling component of garlic oil may help release protective compounds to the heart after heart attack, during cardiac surgery, or as a treatment for heart failure. The data was presented Wednesday, Nov. 16 at the American Heart Association (AHA) Scientific Sessions conference in Orlando. Postdoctoral fellow Kazuhisa Kondo presented additional data on diallyl trisulfide in a mouse model of heart failure.